Here’s a word cloud for the bugs fixed list. This isn’t the raw word count; I did a few things like adding repeats of the word “Fixed” for every SOFT id number, and repeats of the category name (eg “ICE”) for every fix in that category. So the size of the word “ICE” is a combination of the number of ICE fixes (32) plus the number of occurrences of the word “ICE” in the bug descriptions (29). 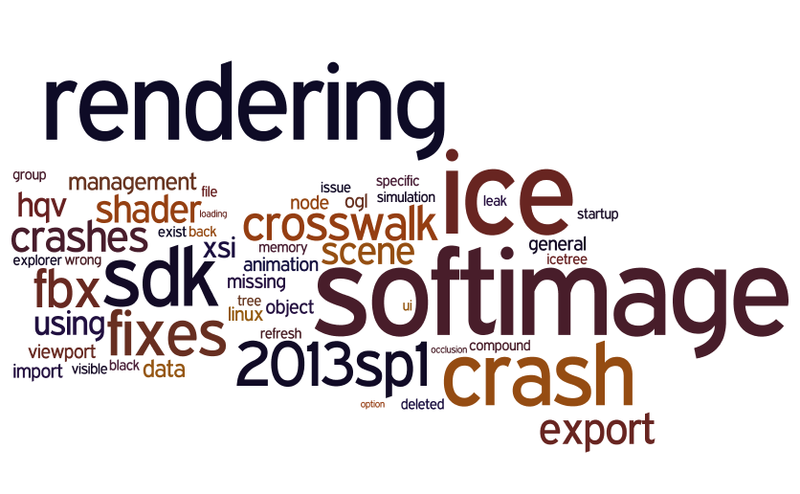 I had added the words “Softimage” and “2013SP1” and “Fixes” to the word cloud on purpose, as a sort of title tags for the cloud. Here’s a cloud without them. Note that some words, like “SDK” and “Crosswalk” and “Rendering”, are there because I added an occurrence of those words for each fix in that category.